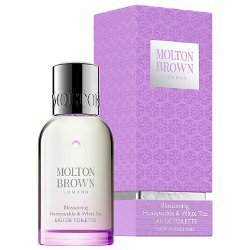 Molton Brown has launched Blossoming Honeysuckle & White Tea, a new fragrance for women. LONDON VIA SICHUAN. Delicate petals unfurling. An embroidered gown of creamy white blooms. Silvery, powdered buds and silky-sweet nectar. Dress in the scent of serene beauty. GRACEFUL. TRANQUIL. BELOVED. The notes include mandarin, honeysuckle, white tea, jasmine, sandalwood and heliotrope. Molton Brown Blossoming Honeysuckle & White Tea is available in 50 ml Eau de Toilette and matching bath & body products, and can be found now at John Lewis in the UK. Quite like the copy here. Enid Blyton fairies getting dressed!